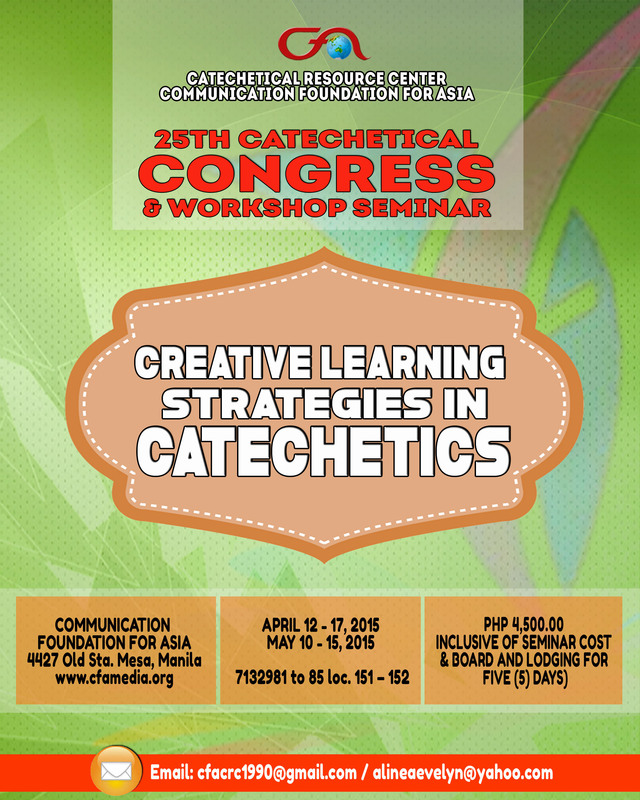 CFA’s Catechetical Congress and Workshop Seminar this year will be about “Creative Learning Strategies in Catechetics”. The workshop will feature Sr. Paz Bandalan, FMA, who will focus on creativity applied in catechetics. Currently the department head of Auxilium Catechetical Center, Sr. Paz is also a retreat facilitator and trainor. CFA’s own Training and CRC Director Fr. Ben Alforque, MSC, will discuss “Catechesis: A response to the Call of the Church in the Year of the Poor.” Sean Herbert Siy, head of CFA’s Sales Department will teach advance PowerPoint production. Held yearly in two batches, the first session starts April 12 and ends April 17, while the second batch is from May 10-15. Registration is now going on for both sessions. Registration fee includes lodging and meals for five days. Please click here to download the registration form. The proliferation of visual technologies like cameras and online image editing tools has made storytelling more engaging. On July 26, 2014, the CFA Training Department will conduct a workshop on Photostories for Evangelization. It will be held from 9:00am to 5:00 pm at the Seminar Room of the Communication Foundation for Asia. Visual storytelling and photosharing give people new ways to connect, collaborate and build community. Through this hands-on workshop, participants will be able to create visual stories using online comic-creating apps, share self-generated photobooks and photoalbums, and find, download and embed relevant photos. Facilitating the workshop are Fr. Stephen Cuyos, MSC and Ms. Bob Lopez who have been conducting workshops on the use of social media for evangelization for bishops, priests, religious and lay leaders nationwide. Here is a sample photobook that participants can create. To flip through the pages, click on the lower right portion of image. To register, kindly follow this link: http://goo.gl/CUV4FW.